Why Are They Called Gummy Bears? In 1920, Hans Riegel, a down-on-his-luck, 27-year-old confectionary worker from Bonn, Germany, quit his job and began making sweets in his kitchen using just a marble slab, a kettle, and bags of sugar. His first creations were hard, colorless candies that he sold to local stores and at street festivals. He had one employee: his wife, Gertrud, who delivered the candies on her bicycle. As for his company name, Riegel decided to combine the first two letters from his first name, last name, and his hometown: Hans Riegel Bonn, or Haribo. Riegel’s sweets sold decently, but what he really wanted was to make something that could stand out from the competition in candy-saturated Germany. He noticed that gummy candies, including wine drops, gumdrops, and Jujubes, were particularly popular, but their shapes were uninspired. Recalling the dancing bears that delighted children at festivals throughout the country during that time, Riegel decided to make a bear-shaped chewy candy. Riegel’s Tanzbären (or “dancing bears”) were longer and slimmer than gummy bears nowadays, and sold two for around one cent. They also came in one color: gold. To get that distinctive chewy quality, Riegel used gelatin, a compound once prized by the wealthy that was becoming widely available. 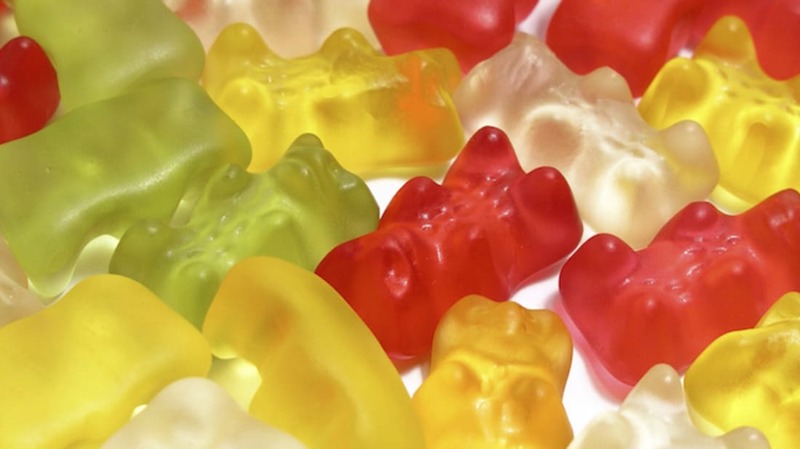 Kids, as you can imagine, went crazy for Tanzbären, and within 10 years Riegel had grown Haribo’s ranks from one employee to more than 160. By the time World War II broke out, the company had more than 400 employees and produced candy by the ton. World War II put a serious dent in production, whittling Haribo down to just 30 employees. Riegel passed away in 1945. After the war ended, Riegel’s sons, Hans and Paul, resurrected the company, and within five years had pumped the labor force back up to more than 1000. In 1960, Haribo was looking to expand internationally and came out with the smaller gummy bears sold today. The company called the new creation Gummibärchen, or “little gummy bears,” and in 1967 finally introduced multicolor varieties. In 1975, Haribo trademarked the name Goldbären, or “gold bears,” paying tribute to the brand’s early years. These days, Haribo makes more than 100 million gummy bears every day and has factories all over the world—a far cry from the tiny kitchen in Bonn, Germany where it all started.